Even though present-day companies tend to care more about their cybersecurity than the security of their premises, managing visitors to your company should always be a serious concern. First of all, even if a visitor presents themselves as a potential client, investor or partner, it’s impossible to do a flawless check on them prior to the visit. Second, even a friend or a family member of an employee can be a potential hazard, which is one more reason for concern. In order to get some of these problems out of the way, here are five visitor management system tips you should use. The first thing you need to do is introduce a visitor badge rule. This is especially true if you have a company that’s too large for everyone to know each other. Your staff and especially your security need to be able to spot a visitor from a mile away. 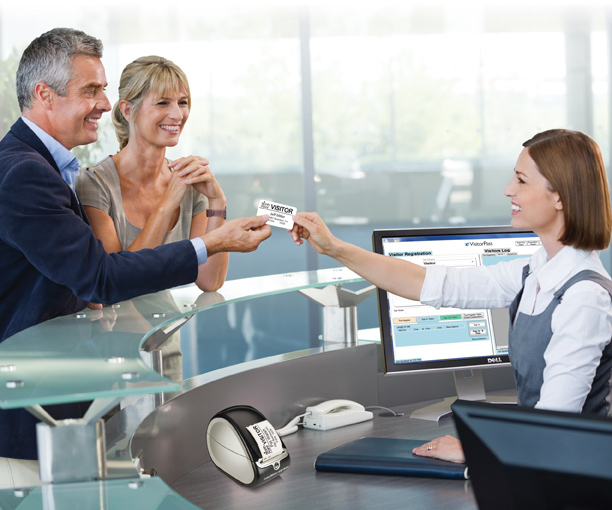 This can be quite expensive, yet, there’s a way to customize your visitor badge system. For instance, you can use your label maker (which you should already have for inventory purposes) in order to make custom visitor badges. In this way, you get the best of both worlds. Another thing you need to do is start reporting on every single visit. Not only that but you need to start doing analytics, as well. For this to work, you need to know the name of every visitor, the reason for their visit, the departure time and their access authorization. Once you have this, your reports will become much more descriptive. The most important thing is that you find someone to delegate this duty to, regardless if this is your security officer or a receptionist. Aside from this, you also need to find a visitor management platform to help with both efficiency and transparency. Earlier on, we talked about the issue of having a company that’s too large for your security officers to know every employee by name and face. On the other hand, some visitor rules need to be enforced from the very start. This is why you always need to keep scalability in mind. Moreover, you need to consider the probability of moving to a different office at one point, so you can’t allow your system to be location bound. Lastly, ask yourself whether this will work once you start a second office or even establish an international office. Don’t underestimate the importance of a physical barrier. This is why most companies still have a gatehouse at the entrance to their premises or a glass wall separating your reception area. There’s nothing wrong about asking for an ID before granting someone access. Keep in mind that this can also protect the visitor in question. Who knows, there may be some hazardous materials, debris or dangerous machinery on premises and letting a random person near them might result in an injury. At the end of the day, while some companies practice an open doors policy, there’s really no reason why your office would be overcrowded with those who have no business there on a daily basis. If you have a meeting, why not make a reservation in a restaurant or meet in a coffee shop. Whenever you can, try to keep your office restricted to authorized personnel only. This will make your job of managing visitors much easier. To sum it up, your visitor management system needs to be a combination of pragmatic policies and efficient tools and accessories. Aside from this, you need to understand that this is an issue you’ll have to deal with regardless of the size of your operations, so always go for a scalable option.